Synopsis (Goodreads): Ten years ago, college student Quincy Carpenter went on vacation with five friends and came back alone, the only survivor of a horror movie–scale massacre. In an instant, she became a member of a club no one wants to belong to—a group of similar survivors known in the press as the Final Girls. Lisa, who lost nine sorority sisters to a college dropout’s knife; Sam, who went up against the Sack Man during her shift at the Nightlight Inn; and now Quincy, who ran bleeding through the woods to escape Pine Cottage and the man she refers to only as Him. The three girls are all attempting to put their nightmares behind them, and, with that, one another. Despite the media’s attempts, they never meet. The easiness of being able to read this book was very pleasant. It was like I was surfing through the pages, reading chapter after chapter. The way we slowly got to know more about Pine Cottage was integrated very well in the story. Revealing a little bit every time. It was a terrifying story, and Quincy (and her friends) must have been gone through hell when they were there. Besides Quincy, the other final girls, Sam and Lisa must have had terrible experiences as well. 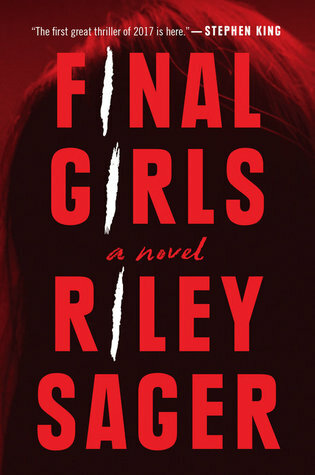 The cases of the final girls were very interesting. I felt a vibe of Criminal Minds and CSI when I read about the murderers, and I happen to love those kind of crime cases. I absolutely enjoyed the characters. I loved Quincy’s baking obsession and the blog she has. It felt so Martha Stewart to me. The complete opposite character of Sam was a good counterpart to Quincy. The complete opposite, but still so alike in a way. Until you figure out what is going on in the books. I felt from the beginning that something was off about Sam, but when all the truth came out in the end I was actually surprised it went a whole different way. I have to say that I didn’t expect the turn in the story. The plot was good. The story didn’t get stuck, there being a twist every while to keep me interesting in the book. The pace was quick, which also made you fly through the book. In the middle part of the book I sometimes felt like I was ready for the finale, but we kept repeating the same scenes between Quincy and Sam. Like the baking, walks in the park, drinking together. It started to feel a little bit repetitive. Though overall I enjoyed it a lot! What do you think? Let me know! Have fun reading!